Most marketing executives understand that quality entertainment can be used to sell a consumer almost any product or service. And while any skilled producer can create a spectacular show, few have the ability to infuse the entertainment seamlessly with a strong corporate marketing message. Fusing the gap between entertainment and brand identity has long been the forte of live event producer, Bob Talmage. His accomplishments introducing apparel and high-tech products to the trade and consumers for brands like Nike, Skeechers, FIFA and Sun Microsystems have earned him a place as a leading producer of live entertainment. 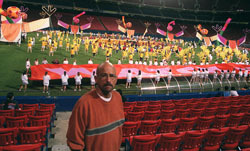 Michael Doherty, Director of Global Presentations at Nike, calls him the industries best producer of corporate theater. Bob brings with him ten years of experience as a principal dancer with the Joffrey Ballet in New York City. “Robert Joffrey first saw me dance in Eugene Loring’s class in 1967 in Hollywood,” Talmage recalls. Although he had only been dancing 18 months, Talmage’s raw ability convinced Joffrey that he was ready for an apprenticeship. In just over two years, Jerome Robbins picked Talmage to dance in his ballet “Moves” even though he was still only an apprentice. To date, Bob Talmage remains the only apprentice to graduate to the company in less than three years. Then, in 1977, the course of Talmage’s life was unexpectedly altered by a near crippling injury that would force him to retire from the ballet forever. “I remember sitting in a theater on Broadway with pins in my leg watching the play Chorus Line and that famous scene ‘What would I do if I couldn’t dance?’ came on,” said Talmage. In that moment, he was swept away by the emotionally charged number and the pure visual splendor of the production. It was then that he knew he would someday create, stage and direct live entertainment. Shortly thereafter, Talmage was recruited by Casablanca Records to act as the label’s in house choreographer. “We would usually start with a record made by a producer, a bunch of studio musicians and some background singers. In order to make the record commercially viable we needed, a group. So we would create these musical artists from scratch. We needed a visual concept, a unique style, the hippest costumes, and expressive dance. We would put together these abbreviated, thirty-minute performances that we could take across the country to clubs. It was a very exciting time for me because I realized for the first time the real power of entertainment to drive commerce. In order to keep my job, I had to sell records. And we were fortunate enough to sell millions of records, and in the process build a number of giant acts including Donna Summer and the Village People,” says Talmage. Currently, his Bob Talmage Associates based in Los Angeles specializes in helping companies use entertainment to introduce their products and services to both trade and consumer audiences. He is currently producing the 1999 FIFA Women’s World Cup, the largest commercial, female sporting event in the history of the United States. He is also prepping his next assignment for Nike, a sales meeting in La Quinta and Skechers fashion show at the Western Shoe Association convention in Las Vegas. Bob Talmage lives on Venice Beach with his three dogs Chance, Janos and Ensor.